The 9h vineyard is all located on the Puisseguin limestone plateau – its southwest-facing slope has a thin topsoil of clay-gravel with excellent natural drainage. Planted 85% to Merlot and 15% to Cabernet Franc, this combination gives the wine roundness, fruitiness, and an opulence typical of Right Bank Bordeaux. 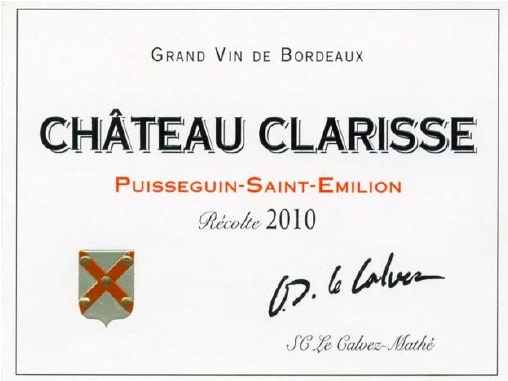 Chateau Clarisse, 2013……This inaugural release combines low yields and a strict selection among the 30-yr old vineyard. The wine’s aromatic complexity and power, length and structure, bode well for its aging potential. Barrel maturation in small oak barrels, of which 10% were new. Vieilles Vignes, 2012…..Rich and sensual, elegant and powerful, this 60-yr old vine version is in keeping with the great modern wines of Saint-Emilion, expressing both the balance and richness of its outstanding terroir.